The vihn.net family of content management products is designed to allow you, the user, control over the content on your website. No longer will you have to employ an expensive programmer or web specialist to make site updates for you. Nor will you have to wait for days or weeks for some independent development company to make an update. You dont have to be an IT specialist to make changes to your website when you use vihn.net products. Add, modify and delete information as needed through our administrative interface. Its as easy as "point and click." This freedom and flexibility over the information and content of your website can help you turn a simple site into an information powerhouse! Once inside the administrative area,users can add/modify/delete the information on their sites in just moments. 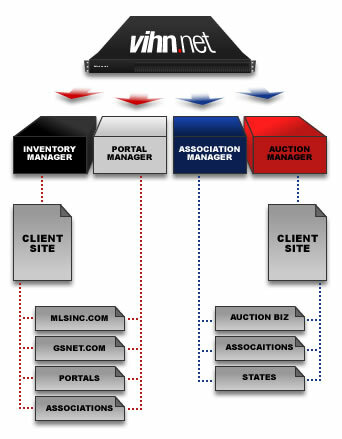 You can describe each piece of inventory, auction, etc., in an as much detail as you desire. Customize the detail fields if needed, or limit the information to just one general description field. Each listing can store up to four images, which our system automatically processes and reformats for quick download even over dial-up modems. You don't have to worry about formatting the images with special software before you submit them online, and your customers will never have wait to download large image files. This ease of use keeps potential customers on your site looking for what they need rather than making them so frustrated they move to a better website. When you update your vihn.net-powered website, that information instantly posts to more than one location. Your site is set up as an affiliate of all our relevant networking partners, who also list your items on their sites as a part of our services. Every time you update the inventory your site information is instantaneously updated on our network partner sites as well! This extra distribution increases the reach of your information, thus increasing the number of potential customers who will see it.